Show season with the Buckeye Reining Series kicked off with a stellar Easter Slide Show March 31-April 2, 2017. The show featured $12,200 in added money, including the $2,000 added Peeko De Oro Non Pro 7 & Up, two slates of NRHA ancillary classes and AQHA open, amateur and youth reining and ranch riding classes. Class sizes soared as reiners and ranch riders from all across Ohio, six neighboring states and Canada, gathered at the Champions Center in Springfield, Ohio for a weekend of tough competition and tons of fun. 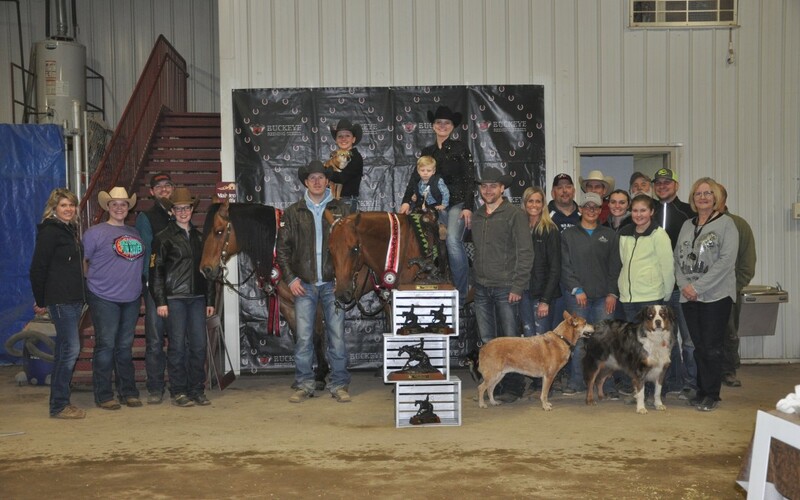 The Peeko De Oro Non Pro 7 & Up and concurrently run non pro ancillary classes were the main event Saturday night as 66 non pros and their mounts vied for the bevy of money and prizes. But before the competition got serious, the crowd cheered and laughed as attendees ran in the first ever BRS Boot Races. And the winners pulled out all the stops in their quest to win a free pair of boots, generously sponsored by Ariat. Pizza was then had by all as the cheers and competition continued late into the evening. The events Saturday night showcased the fun and deep competition that was a reoccurring theme throughout the weekend. As a new partner with the Ohio Quarter Horse Association (OQHA) for 2017, the Buckeye Reining Series AQHA classes gave many exhibitors the opportunity to earn world show qualifying points as well as OQHA points. The class sizes were large as the AQHA Youth reining and Amateur ranch riding were 4 point classes each. The Open and Amateur reining and Open ranch riding classes were also popular among exhibitors as entries grew to a 3 point class size. In addition to the AQHA points, the Buckeye Reining Series also awarded more than $2,500 in prizes to the Top Five in all AQHA classes. Youth events are also an important part of every Buckeye Reining Series show and the Easter Slide has become known as a favorite event among many young attendees. The BRS Youth Scholarship kick off meeting was held during the show and the Easter Bunny made his annual appearance just before the egg hunt sent kids searching throughout the barn. Painting Easter eggs and a messy egg toss were also some of the fun had by many youth. Adults had plenty to do and see as well as vendor and sponsor booths filled the main aisle offering plenty of shopping and a great social atmosphere. The next Buckeye Reining Series event is the Leonard Truck and Trailer No Entry Fee Derby Show May 25-28, 2017. For more information please visit www.buckeyereiningseries.com.